I recently returned from a girls’ weekend in San Francisco spent mostly in search of one of my newest big city favorites, mobile food carts. Gaining in popularity in cities up and down the West Coast, food carts offer a wide range of gourmet offerings, down-home cooking, and ethnic dishes, all for a reasonable price. 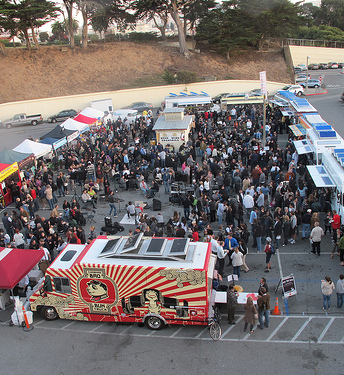 My girlfriends and I were lucky enough to visit San Francisco on the last weekend of the season for “Off the Grid”, an organized gathering of more than 25 food trucks at Fort Mason Center. The food vendors parked their trucks in a large circle, and put chairs in the inner circle for eaters to sit. There was even a live band playing while we were there. The star of the show however was the food. The three of us decided to share all our food so we could sample more trucks, and boy, were we happy. 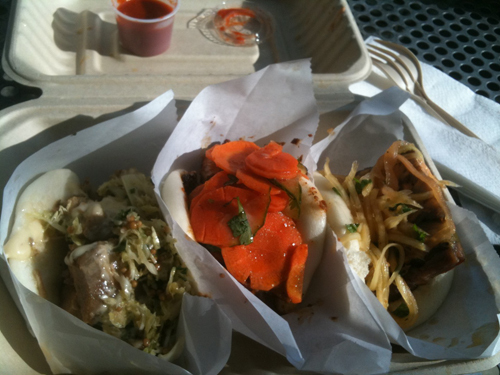 We ate delicious spicy pork marinated in Korean seasoning at Hiyaa, fabulous pork and chicken steamed buns from Chairman Bao and outstanding Filipino tacos from Hapa. The dishes ranged from $4-$9 and were all great. Portland also has a great food truck scene, and I’ve been lucky enough to sample a few dishes in this foodie city as well. I’m a fan of tandoori chicken from New Taste of India, and beef pho from Mai Pho Vietnamese, but my favorites to date are the pie holes (mini-pies) from The Pie Spot. We’ve sampled marionberry, lemon, and pecan, and found them all delicious. Whenever I’m headed to Portland, I peruse the latest news in food carts on the excellent online guide to Portland’s food carts, www.foodcartsportland.com. Food carts are not restaurants. Thus there is often no seating, there are no bathrooms, and menus are limited. 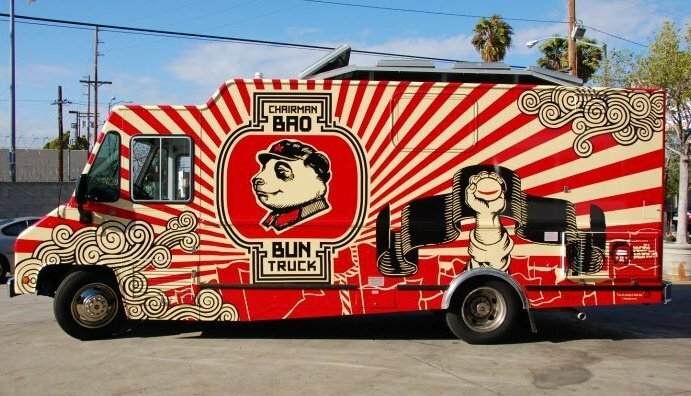 On our San Francisco trip, after seeking out Chairman Bao’s food truck on a downtown street for lunch, my girls and I wondered if food carts have to abide by the same parking rules as all the rest of us, when they’re parking in metered spaces. According to a recent article in the San Francisco Chronicle, they do. Many argue however, that food carts are stealing business from restaurants, and paying far less in permits and rent to do it. I certainly wouldn’t be happy if someone parked a truck outside Travel Essentials and began selling luggage. But perhaps there’s some compromise here, because lord knows, I want to keep visiting Portland and San Francisco and continue sampling the delicious and amazingly varied wares of the food trucks.